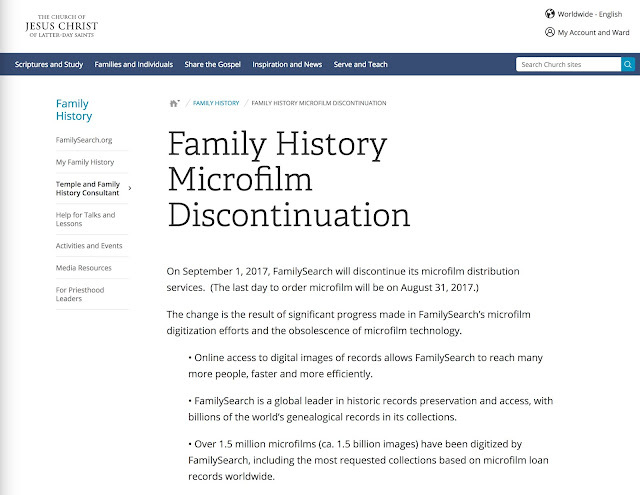 Part of the strategy of FamilySearch.org in discontinuing the shipment of microfilm involves a consideration of the fact that many more records are available from other large online genealogy websites. My experience is that many of the records currently in the FamilySearch.org Catalog can be found on other websites. For some time now, I have been compiling a list of Rhode Island resources that I will be reviewing for my own personal family research. Many of the microfilm records listed in the Catalog are now available, some in other formats, from other online sources. I was also very recently doing some extensive research into German language records from Bavaria. There is a long list of these records that, absent the end of microfilm shipping, I would have been ordering from Salt Lake City. Subsequent to the announcement, I began to search for other sources online. A commentator to one of my posts suggested that I look at the Archion.de/en/ website. 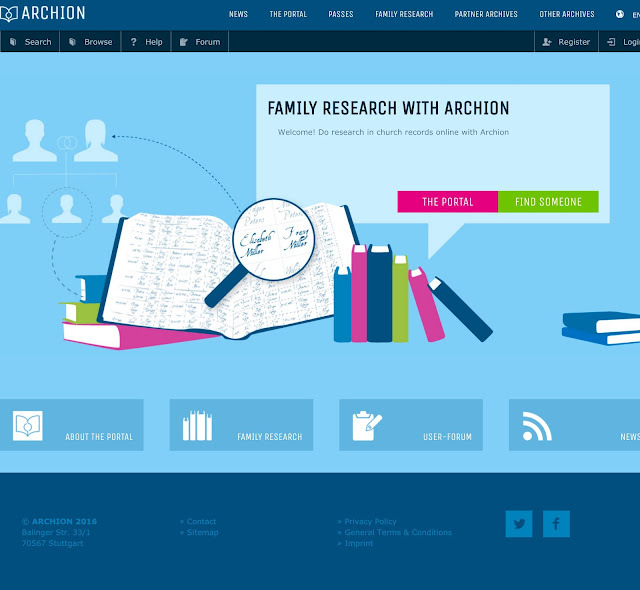 Archion.de is a German language website is a cooperative project of the Evangelical Church in Germany (EKD) and the majority of the regional Protestant churches in Germany for digitizing baptisms, marriages, funerals, and confirmations. 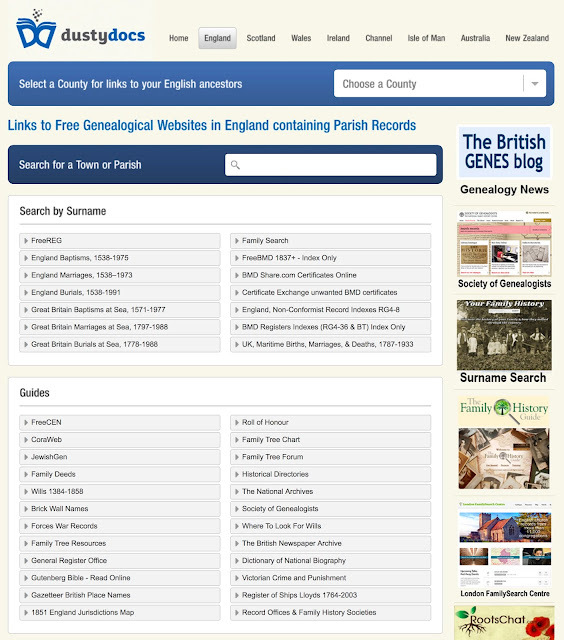 Their database currently contains more than 20 million pages of church records. However, as a contrast to FamilySearch.org, this is a pricey subscription website. A basic one-year pass to the website which includes a limit of 2000 copies is priced at 599 Euros or $684.09 U.S. dollars at the exchange rate at the time of this post. This kind of cost illustrates the value of the FamilySearch.org website and reasonableness of the prices on many of the other online subscription websites who have many more records and a wider appeal. On the other hand, this expensive website also provides and explanation as to why FamilySearch.org has been forced to renegotiate some of the agreements it has had for years with the originators of the microfilm records. Simply put, these originators of the records now see that these records have a monetary value and are unwilling to allow FamilySearch to put them online for free. So, if I cannot get the records from FamilySearch without traveling to Salt Lake City, Utah, there are some alternative available. 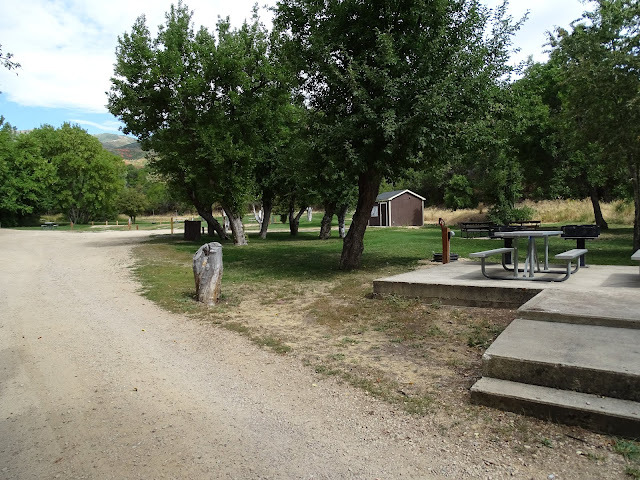 However, in some cases, these alternatives may be as expensive as traveling to Salt Lake City. If I had started a food or recipe blog instead of writing about genealogy, I would probably be rich and famous. But then again, I don't know much at all about cooking and I do not think a lot about food. My most remarkable food achievement is frying eggs for breakfast. On the other hand, writing about a popular topic such as food has its advantages. 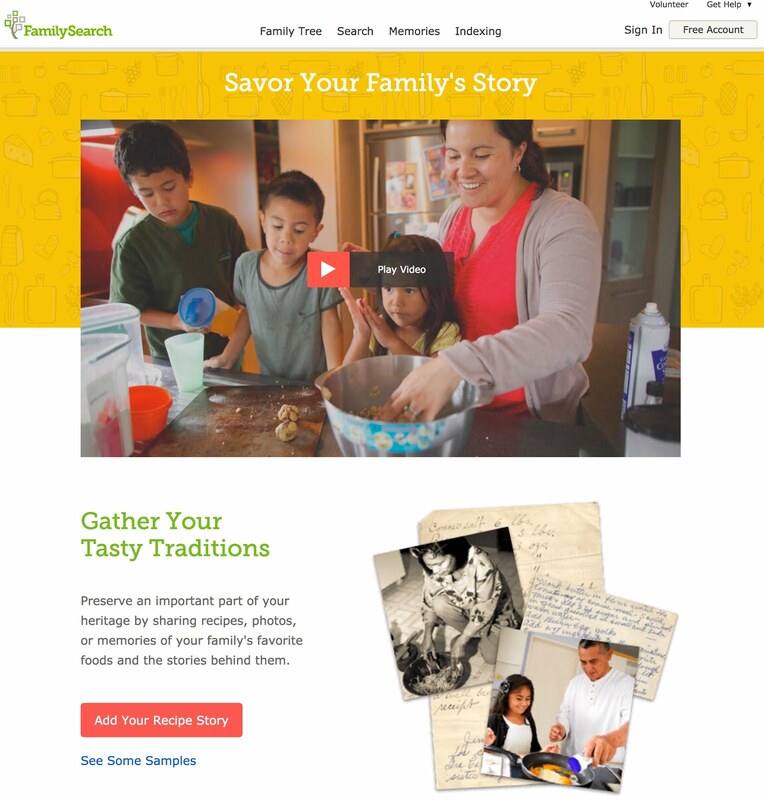 FamilySearch.org seems to have finally figured out that recipes and food are a big draw and they have added a food section to the FamilySearch.org website. 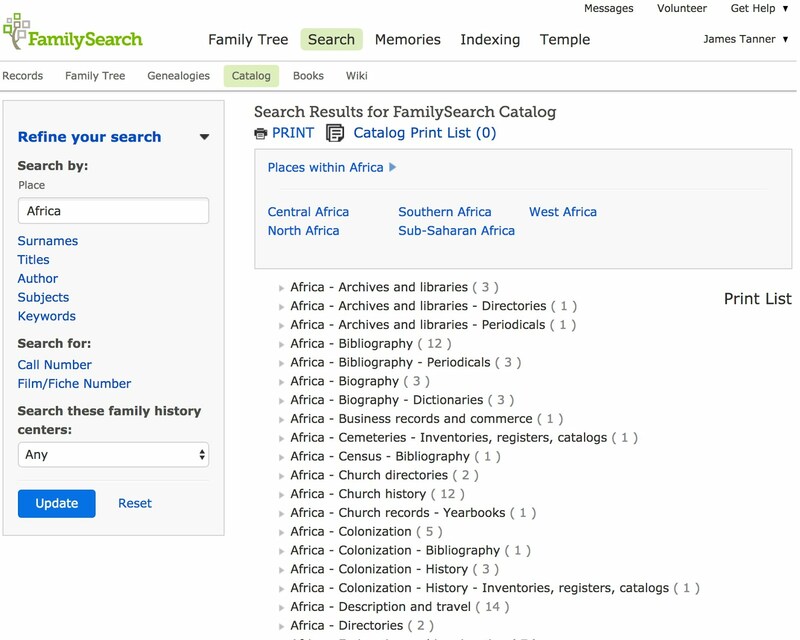 Unfortunately, this is another section the FamilySearch.org website that you can't get there from here. There is no permanent link to the Recipe page from the startup page. There is, however, a dynamic link that may appear on your version of the homepage. But if I sign in, the link disappears. 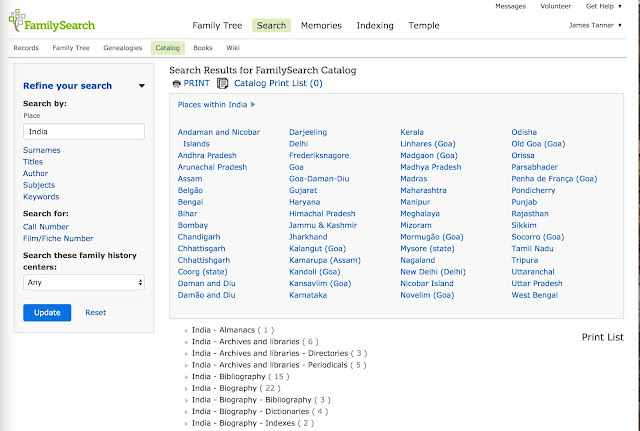 I also cannot find the link in the FamilySearch Site Map. 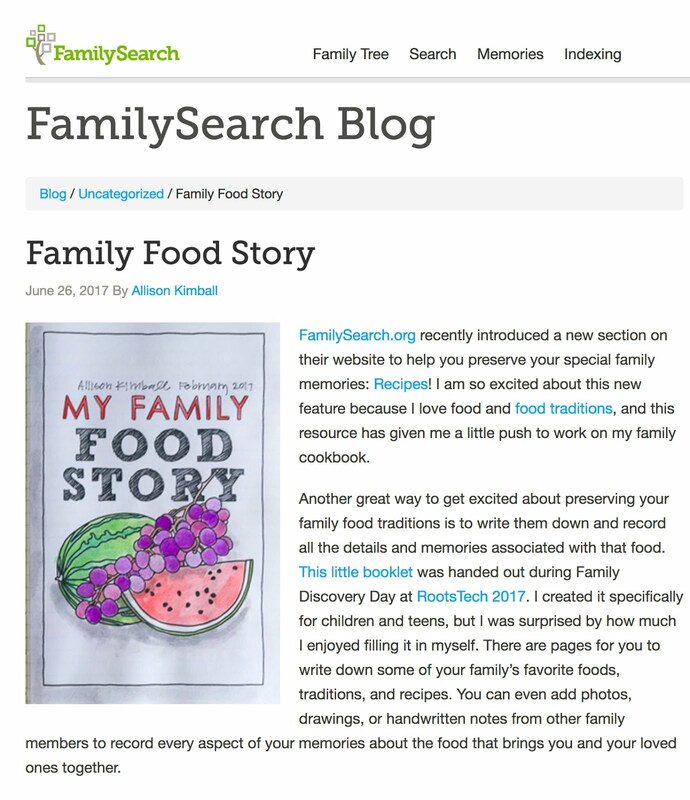 I guess this recipe section will join a number of other obscure and unlinked pages that have appeared on the website for a while such as FamilySearch.org/Pioneers and other such pages that are floating around out there. It might be helpful if FamilySearch gave us a list of all these extra added attractions to their website. The main idea of backing up your computer files is to make separate copies of your files in different venues, i.e. places where the files are stored. The primary device is the one creating the file. For example, you take a photographic image of your family at a reunion. If you use your digital camera (the primary device creating the image), the image is stored in the camera's memory or on a flash memory card (the venue). What happens if you lose your camera? You lose all the photos stored in your camera. What happens when you take enough photos to "fill up" the memory storage capacity of your device (either the camera's memory or the storage card)? You either have to erase some of the photos or transfer them to another venue (storage device). 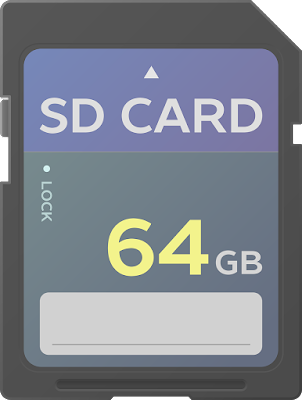 If you are using a storage card such as an SD Card, you could buy another card and replace the one in your camera. If you did this, you might have one or more "full" SD cards stacked on your desk or in a drawer. Once again, if the card (which is very small) is lost, all of the photos are lost. Putting a fresh card in your camera just allows you to take more photos, it does not backup the photos already on the first SD Card. You could, and should, connect your camera to your computer. Some computers, such as mine, have an SD slot available and all you have to do is take the card out of your camera and insert it into the slot and copy the photos onto your computer's hard drive. In other cases, you may need a cable or some special adapter to connect your camera to your computer to make a copy of your photos. Some newer cameras come with WiFi and you can transfer your photos to a folder on your computer without a visible, physical connection. So now you have two copies of your photos; one on the original SD card and one on your computer. If you are like me, you then erase your SD card to use it again rather than buying an endless series of cards. What happens if your computer crashes or the file is somehow lost. You are back to space one, you have lost all your photos. If you still have the full SD card, you could copy the photos over to your computer again. But if you have erased your SD card to reuse it in your camera, you have permanently lost your photos. Now, let's focus on the photos you have copied to your computer. The photos are only a part of all the information that is on your computer from research to scanned images of documents and everything else you have been working on. Computer crashes are real. I have been through several over the years. OK, before I write about backing up your computer, let's start over again with your camera. Let's suppose you are using your smartphone as a camera. This is a perfectly good option and from watching people at the Brigham Young University, I am guessing most people now rely more on their phones for photos than a separate camera. Your smartphone may or may not have a separate SD card memory. Let's assume it does not. If you love to take photos of yourself and your family, you will quickly fill up the memory of your smartphone. If your smartphone has an SD slot, you could buy a few of these memory storage cards. Hmm. We are right back where we were before. However, with your smartphone, you have another option. You could simply upload your photos to some online photo storage provider. Many people upload their photos instantly to Facebook or Instagram. However, these are not really storage venues, they are social networking programs. They may "store" your photos, but what if you want to retrieve them from Facebook or Instagram (or some other website). Do you know how to do that? This whole process seems to be getting pretty complicated. Oh, by the way, Facebook does have an option to download the photos. This means that you could end up with the photos on your own computer. The idea here is that a "file" (in this example a photo) is created by a particular electronic device (in this extended example a digital camera or a smartphone) and then begins its progress to preservation and storage. In future posts in this series, I will write about how the file is best preserved and stored. How many of you out there have used a microfilm reader in the past year? I am sure that the number of people using these devices has dropped precipitously over the past few years. I have seen the number of microfilm readers in the Family History Library in Salt Lake City, Utah, drop year after year and the number of people hunched over the images have now been replaced by people using computers. My first introduction to doing research on microfilmed records was over thirty years ago. Recently, I have been using microfilmed record directly from the microfilm consistently since the records I need to search are not yet available digitally online. I just counted the order slips in my pile and I have ordered 32 rolls of microfilm since I started doing research at the Brigham Young University Family History Library in addition to looking at the rolls that were already in the Library. I would guess that this is an exception to the rule. Microfilm, like reel-to-reel tape decks, cassettes, and eight-track tapes is just another obsolete recording media. Despite its central role for genealogical researchers over the years, its time has passed. By the way, CDs and DVDs are on their way out also. We will accommodate the changes and very quickly forget these media formats even existed. The apparent impact on genealogists is more of a reflection on the genealogical communities overwhelming reactionary attitude rather than the change will have over time. The increased immediate availability of digitized records will have a much greater immediate impact on genealogical research than all of the microfilm has had since its inception. Rather than worry about the fact that microfilm is disappearing, perhaps we should focus more on the millions upon millions of records that are appearing online daily, weekly and monthly. In an official press release dated June 26, 2017, FamilySearch.org announced that it would be discontinuing the shipment of microfilm to users as of September 1, 2017. The last day for ordering microfilm will be August 31, 2017. Here is the text of the Press Release. What about the availability of microfilmed records that are not presently digitized and will not be digitized until some time in the next three years? 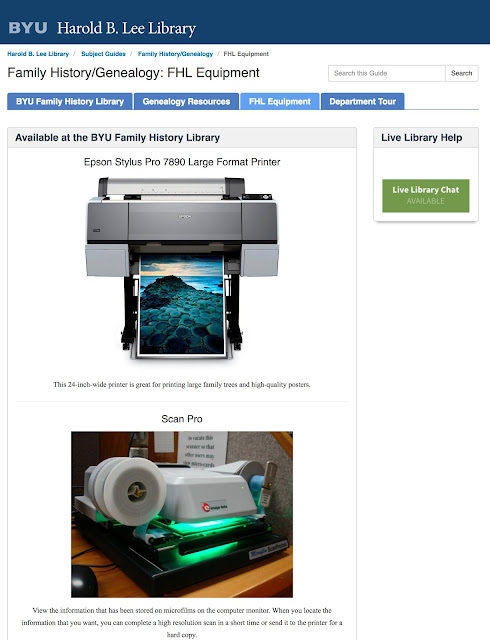 What happens to the present availability of the microfilm collection at the Family History Library in Salt Lake City, Utah? 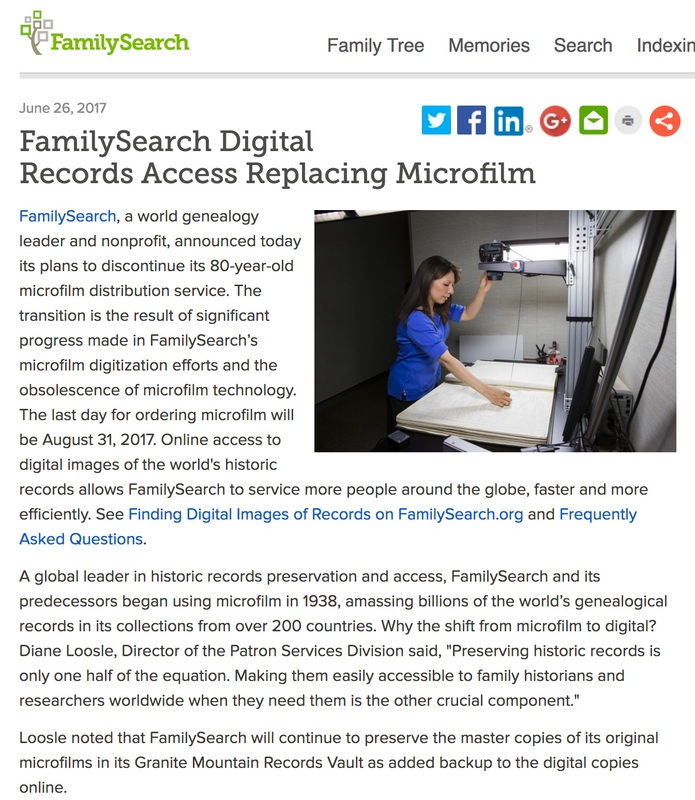 How much longer will microfilm readers be available in the Family History Centers? There are probably a lot more questions. I have also been writing for some time about the future of Family History Centers given that the research done in the Centers will "all be online" in the future. But that is a post for another day. Here is the link to the obituary for Ruth Ellen Maness. Throughout history, racial and ethnic disagreements have been a driving force in starting wars. During my lifetime, millions of people around the world have lost their lives as a result of "ethnic cleansing" and racial strife. In the United States, racial conflict is a constant and ongoing theme. Underlying this racial tension are beliefs based on supposition, speculation, and incomplete and inaccurate oral tradition. One outstanding fact that is starting to emerge from the widespread genealogical DNA testing procedures is that for almost everyone, both racial and ethnic purity are illusions. The above chart has nothing at all to do with DNA testing. 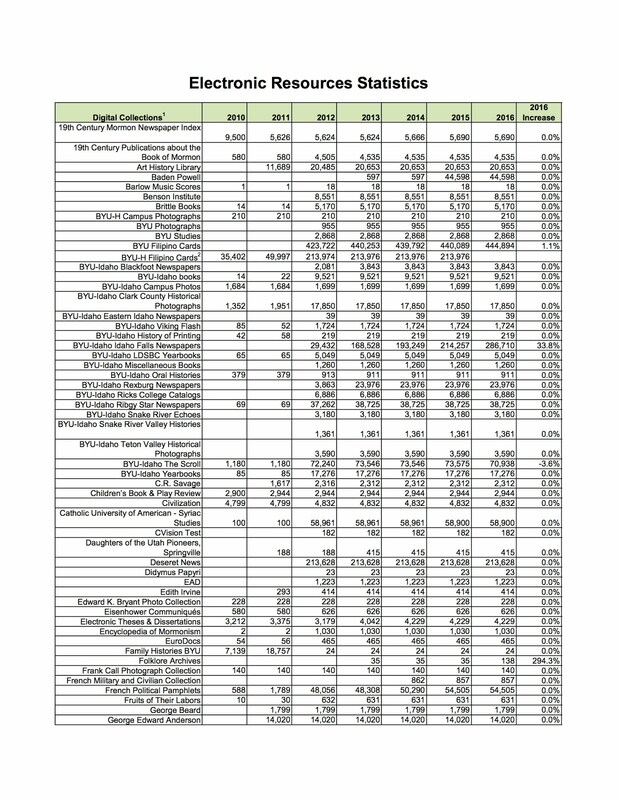 It is a chart showing the composition of my ancestors by country of origin taken from the FamilySearch.org Family Tree. Am I Engish? Am I Irish? Am I Danish? Or am I something else entirely? I can claim to be partly American back to the beginnings of European settlement, but does that make me a native American? 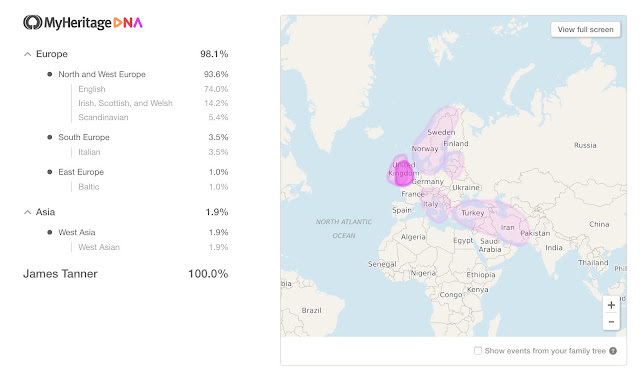 What happens when I add DNA to the mix from MyHeritage.com? How much "Italian blood" do I need to claim to be Italian? How did I get Italian DNA? Who are my Middle Eastern ancestors? What happened to my ethnic purity? If there is a racial conflict between any of these groups, whose side am I on? I have "white" friends who would have been subjected to intense segregation in the southern part of the United States if their DNA testing results had been known showing that they had more than "one drop of Black blood." Because I have Middle Eastern ancestors will I be subject "ethnic profiling" and questioned when I board and airplane in the United States? Does the fact that I share over 98% of my DNA with chimpanzees make me a monkey? See "Animals That Share Human DNA Sequences" Perhaps the 90% of my DNA that I share with mice makes me a mouse. In the past, genealogy has been used to "prove" racial purity. What we are learning today is that any idea that someone is "racially pure" is an illusion. We are all one huge human family and we only differ from our animal and plant cousins by very small percentages of our DNA. If there is one thing that comes out of the extensive genealogical DNA testing is should be that the concept of "race" is destroyed. It is my privilege and honor to call Ruth a friend. She has been my friend for many years. I have watched her befriend and help so many others as well. I can’t remember when we first met, but I'm sure it was at the Family History Library, where she spent so many hours, weeks, months, and years. Even after retirement, she continued to volunteer there, to help patrons with their research questions. Ruth was the testing administrator for The International Commission for the Accreditation of Professional Genealogists. She held accreditation for multiple countries as well. Ruth was a huge support for and encouragement to us as we contemplated holding that first Expo in St. George, Utah, so many years ago. She always supported family history events and the opportunity to share her knowledge with others. Since retiring from FamilySearch a few years ago, she has traveled with us extensively throughout the United States. She has written and contributed to several Research Guide books for the benefit of researchers for years to come. 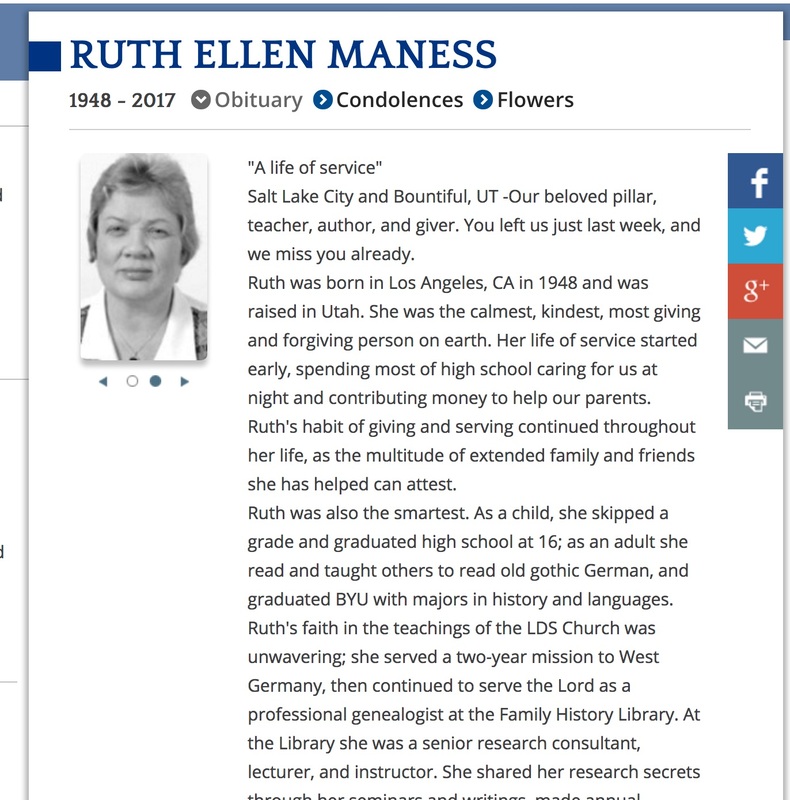 Ruth was a pillar in the genealogy community and will be sorely missed. There are always a few visible and highly acclaimed individuals in every profession and avocation. Ruth was quiet and modest but she spent almost her entire life helping others find their ancestors. Her knowledge of German and Scandinavian resources was encyclopedic. She was truly one of the greatest researchers I have every met or worked with. She will be sorely missed by those of us who knew of her greatness. I have found, over the years, that the real heroes of genealogy are usually the quiet, unassuming people who go about helping others without recognition. Ruth was certainly one of the greatest of these. Taleb, Nassim Nicholas. 2010. The Black Swan: the impact of the highly improbable. New York: Random House Trade Paperbacks. Genealogists are particularly susceptible to the narrative fallacy. The distinguishing feature of a narrative fallacy is its believability. Even without realizing it, genealogists tend to be selective in the sources they accept and reject those that do not fit within their preconceived narrative. Once the genealogist has made his or her selection of the facts, the narrative becomes the new reality and any other interpretations of the same factual background are rejected. Yes, I know there is a written record for Nathan Tanner showing Elizabeth as his mother. Also in his will, he mentions Elizabeth as "my beloved mother." This is obviously wrong and I might add, is a very common occurrence in the very early colonial records. The writer of this email is trying to justify rejecting both a birth record and a written will in an attempt to establish a different mother for Nathan Tanner. In effect, the writer is ignoring two separate and independently maintained historical records in order to justify a preconceived conclusion. This is, in essence, the narrative fallacy. 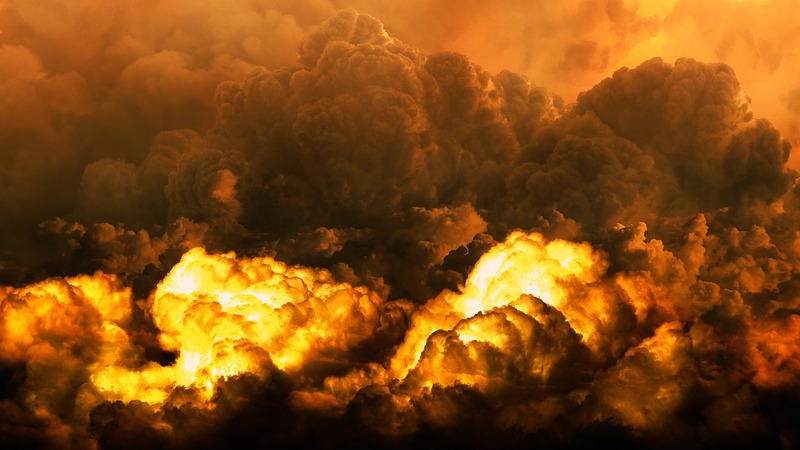 How do we avoid being caught in the narrative fallacy? I suggest that this may be one of the most difficult intellectual attainments. Our worldview is to a great extent determined by our cumulative experiences. While doing genealogical research, we have a tendency to place more emphasis on the documents and records we find supporting our preconceived viewpoints and therefore use those to reinforce our ongoing narrative. Interestingly, the email writer cited above derives support by quoting from a book which he/she acknowledges has no supporting sources and wish exactly contradicts his/her conclusions. We find ourselves in this predicament whenever we try to justify a continued support of a cherished family tradition when the narrative is contradicted by historical records and documents. I will be coming back to this topic from time to time as I discover examples supplied by accommodating genealogical researchers. Genealogy is a solitary pursuit. In its traditional paper-based past, a genealogist worked as an individual researcher. Occasionally a family would cooperate and share some of their joint information, but even with this sharing, families remained isolated from each other. This genealogical isolation first began to break down with the establishment of the GEDCOM program back in 1984. During my first twenty or so years of doing genealogical research, I worked entirely on my own. None of my immediate family members were at all interested in what I was doing and I was entirely unaware of the efforts of any other living family members. Even sharing my files by uploading copies of my data to the Pedigree Resource File did not provide any collaboration or sharing opportunities. Across my many family lines, the research was fractured and disjointed. Some lines seemed to be well researched as evidenced by a collection of surname books, but others had apparently been entirely neglected. Slowly, as computer technology advanced, I was able to obtain an overall view of my family lines, but I still had no contact with any other family members. 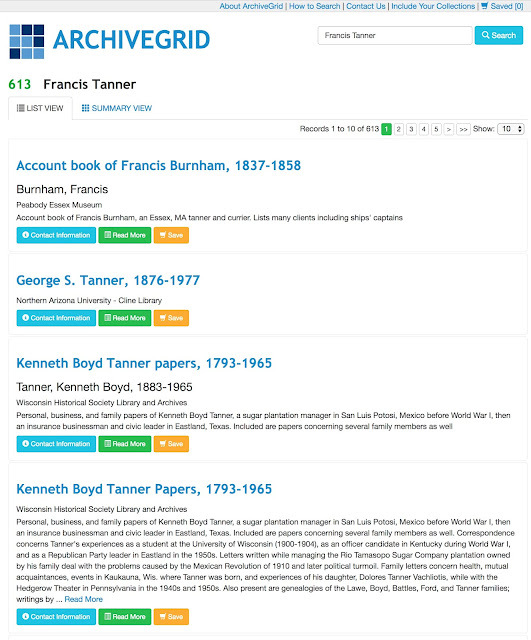 On some of my lines, such as the Tanner family line, to this day I have still never encountered a serious, source-based, genealogist who is actively working on this family line. The effect of this isolationist fragmentation was that there was no "feedback" and errors accumulated rather than being eliminated. With the introduction of the internet, individual online family trees became a possibility. 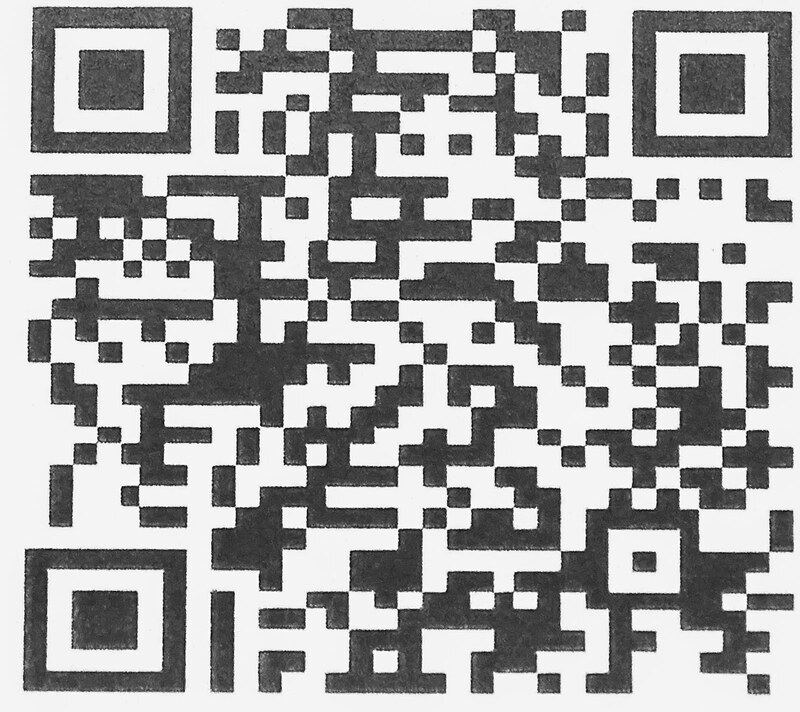 The internet opened up a way to share information. Unfortunately, the "sharing" process that evolved consisted primarily of indiscriminate copying. 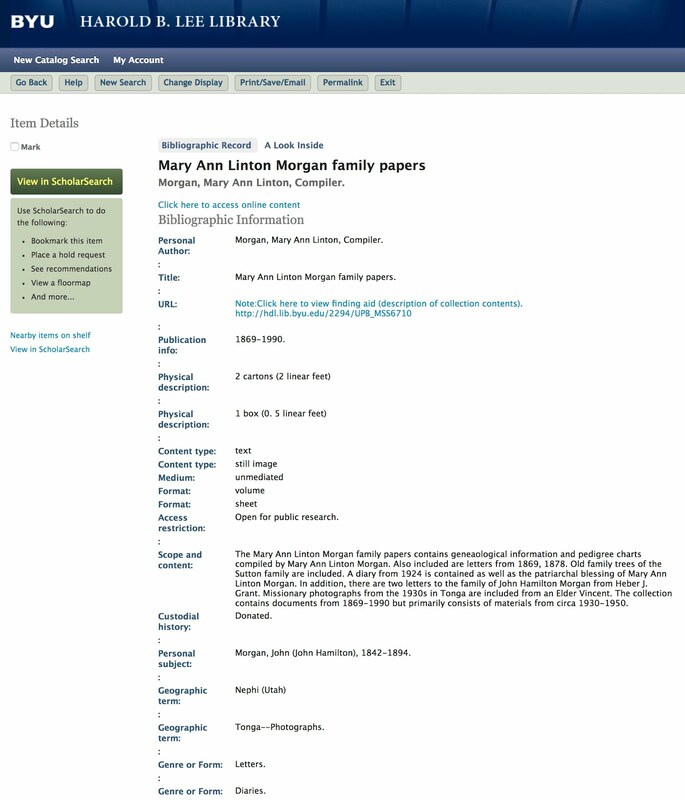 Shortly after online family trees became available, I began to realize that my early uploaded copies of my family lines, including all my early wrong conclusions and errors, were being quickly and efficiently copied across the internet. The seriousness of this situation became evident when FamilySearch introduced the new.FamilySearch.org program. Some of my ancestors had multiple hundreds and perhaps thousands of copies. Most of these copies originated as result of the isolated word of family members for over a hundred years. But a significant portion was also the result of copies made from online sources such as the Ancestral File and Pedigree Resource File. Because each "genealogist" or "family historian" had to have their "own" copy of "their family" the number of copies, with all the accumulated errors and wrong conclusions, proliferated at an extraordinarily fast pace. 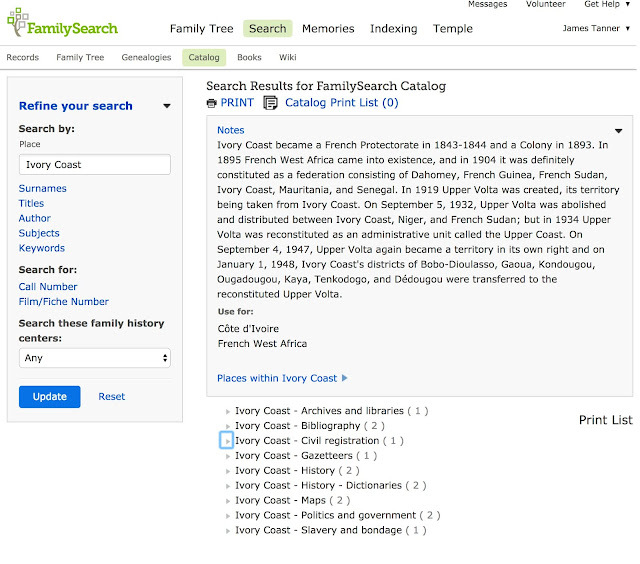 The solution was the introduction of the FamilySearch.org Family Tree. This free, online, unified, collaborative program allowed everyone to cooperate and collaborate in fixing the problems generated by the years of isolation. Guess what? Some individuals feel threatened by the unified program. There is still a huge core of isolationists who think they own their ancestors and that they somehow are right when all the rest of the world is wrong (sort of like some of the governments out there today). They not only fail to share their work, they become belligerent and protective to the point of refusing to cooperate with anyone. The tragedy is that they are very likely spending their lives duplicating research that has already been done. The Family Tree acts as a giant clearing house for genealogy. If you put your research in the Family Tree, then anyone else can see what has already been done and does not have to repeat your work. But what about the issue of changes? Yes, the information in the Family Tree is in a state of flux. But that is the price we pay for over a hundred years of isolation. 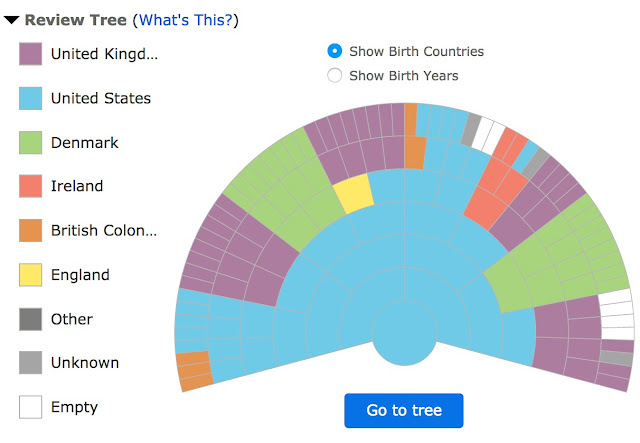 But what about the other online, collaborative family trees? Yes, there are some other collaborative family trees but FamilySearch is in a unique position due to its sponsorship by the worldwide organization of The Church of Jesus Christ of Latter-day Saints. The Church has far more than a mere economic interest in maintaining the integrity of the Family Tree. The Family Tree may evolve in the future, but it will be maintained in some fashion as long as is foreseeably possible. But what about the isolationists? Too bad for them. They are condemned to spending a life duplicating the work of others and in the end having all their work lost to their posterity or anyone else for that matter. A short time ago, I was asked to help a patron who had come from out-of-state to the Brigham Young University Family History Library with some genealogical research in the Philippines. 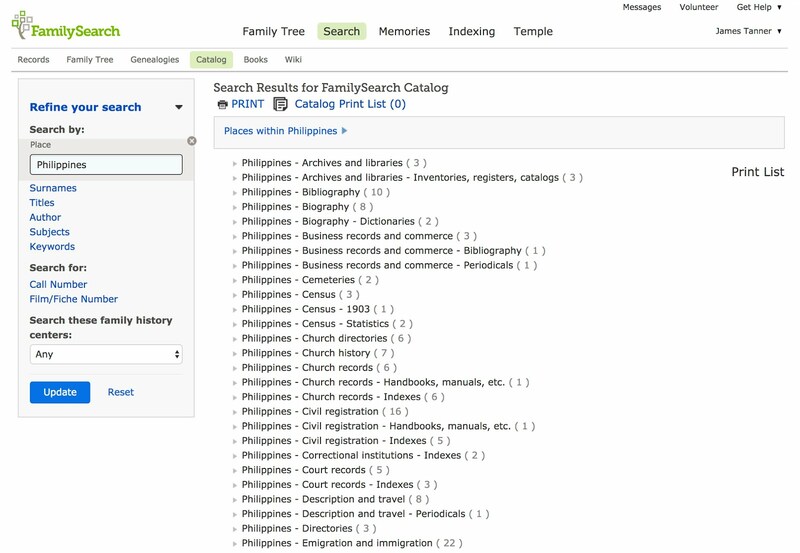 I immediately accepted the opportunity because I simply assumed that FamilySearch.org likely had a large number of records from the Philippines for the reason that The Church of Jesus Christ of Latter-day Saints has a large number of members in that country. I was not disappointed. There were a great number of records and I soon found some crucial ancestral names for the patron. The patron was obviously very happy. But what about finding records on the FamilySearch.org website from countries where there are few members of the Church? I learned from some of the other missionaries at the BYU Family History Library that the website had a large number of very useful records from India (see the screenshot above). Then I got interested to find out what other countries, outside of those usually associated with genealogical research, might be represented by records on the website. 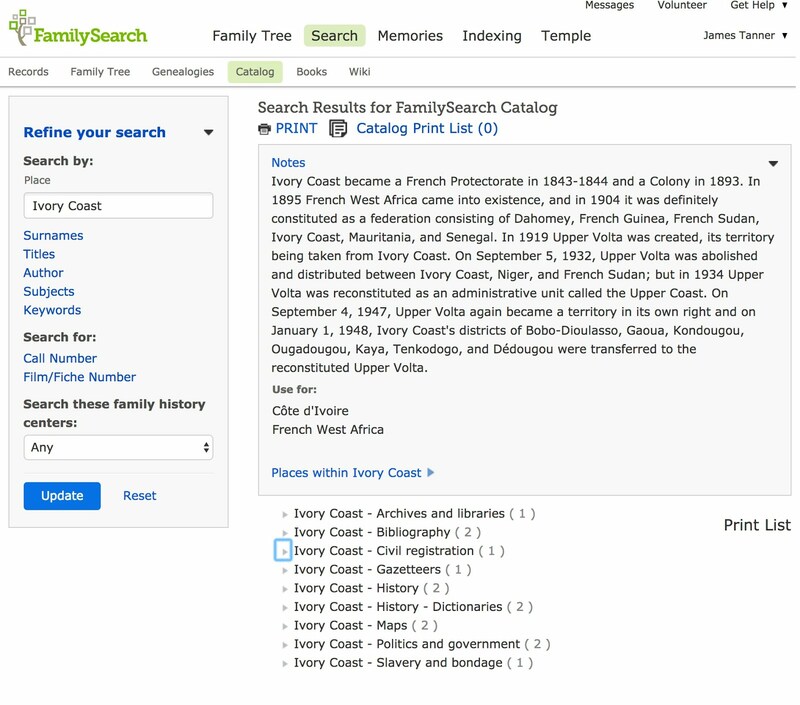 One key to answering the question is to start any search by using the FamilySearch.org Catalog rather than simply looking at the list of digitized records available in the Historical Record Collections. For example, there is a huge list of records from Italy. Granted, there are still places around the world where genealogical records are not easily obtained, but before you make such a conclusion, I would suggest that you do extensive online searches. 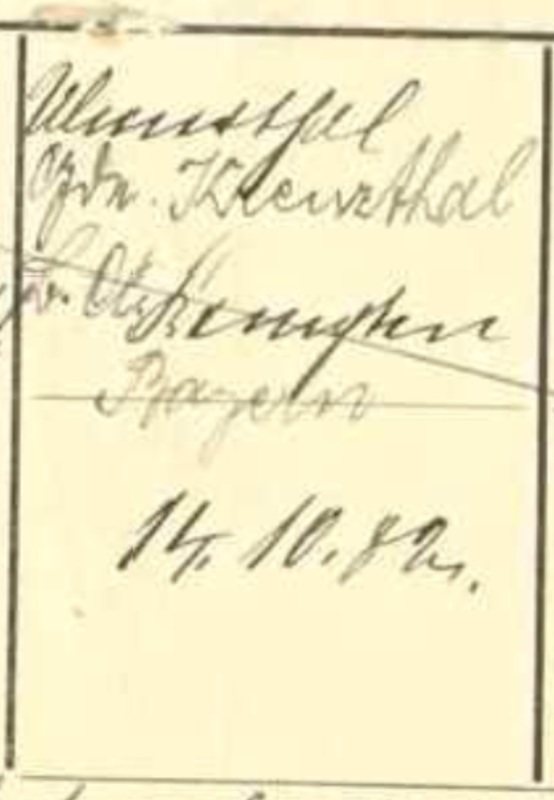 The FamilySearch.org website has more than a hundred year's worth of accumulating records and I would not discount the fact that some records may have been obtained that are pertinent to most of the world's population. Another example comes from China. It seems that many researchers automatically assume that Chinese records are not available. However, FamilySearch has a huge and rapidly increasing number of records from both China and Taiwan. Here is a representative screenshot. You will never know what you are missing until you look. One last example. This one is from Africa. If you keep clicking down in the places included links, you will see additional resources, but you can also search by looking for a specific country. 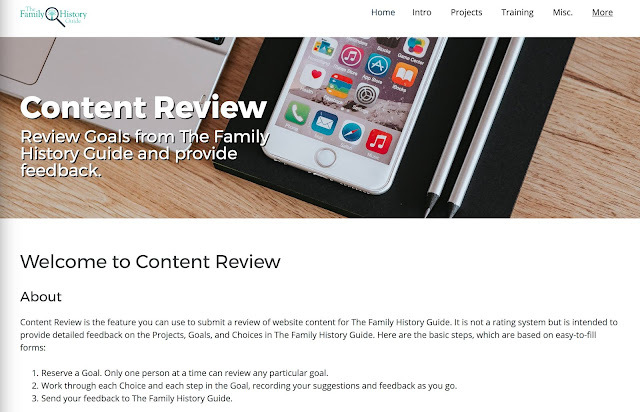 To greatly increase the number of people actively involved in family history worldwide, and to make everyone's family history journey easier, more efficient, and more enjoyable. The Family History Guide is being used as an essential training tool at the Family History Library in Salt Lake City, the BYU Family History Library, the Riverton FamilySearch Library, and many Family History Centers around the world. 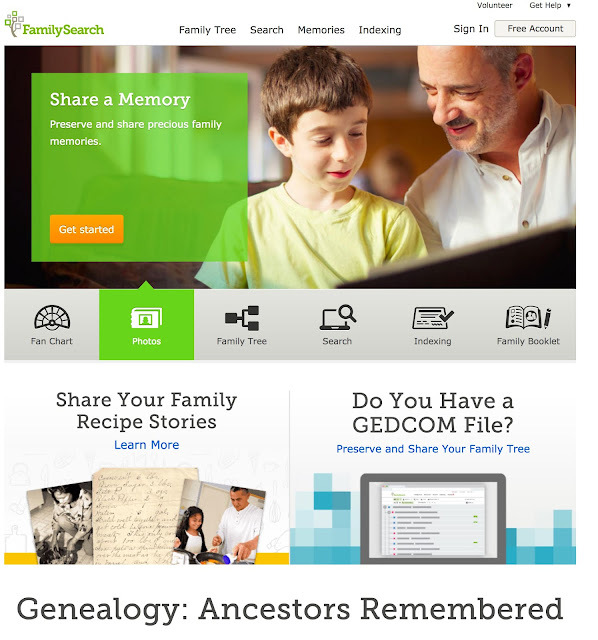 The Family History Guide contains thousands of links to valuable family history resources. It is a monumental job to keep all of that useful content updated and accurate. It is also possible that the users can see additions and corrections that need to be made to the content. For those reasons, we have implemented Content Review. Reserve a Goal. Only one person at a time can review any particular goal. Work through each Choice and each step in the Goal, recording your suggestions and feedback as you go. 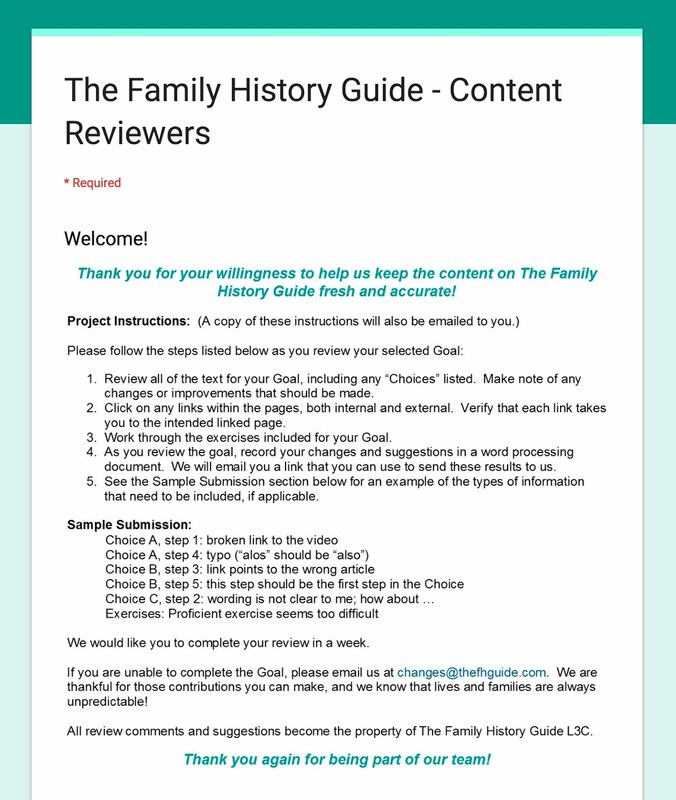 Send your feedback to The Family History Guide. The submission process uses a Google Docs page to submit suggested changes. The instructions for reviewing and submitting changes are easy to follow and of course, you can also submit suggestions about the content of the Content Review itself. We invite all who are using the website to consider sending us a Content Review when you find broken links or feel that further additions are or would be helpful. Asimov, Isaac. 1950. Pebble in the sky: science fiction. London, England: Sidgwick & Jackson. The edition that I read was most likely one of the many published in the United States about the same year. Here we are more than 60 years later. Now we can read the "old" science fiction and see how many things they got "right" and how many things they got "wrong." We have to remember that the people who wrote much of the old science fiction (maybe not so much the folks shown above on the Amazing Stories cover) were smart and thought about the future a lot. Did they really get things right? What does this have to do with genealogy? Just about everything. Let me give a little background. 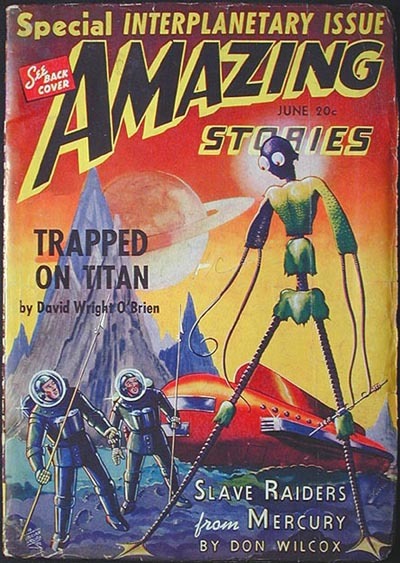 If you go back and read science fiction from the 40s and 50s, you immediately see a disconnect between the future portrayed by the writers and what we are living today. In some ways, such as space travel, we are hopelessly behind where we should have been according to the science fiction writers. We have no colonies in space, no settlements on Mars or Venus and nothing at all on the Moon. We certainly have not discovered evidence of interstellar travel and have no way to speed up the time it takes to get to the planets around another star. Star Gates, Warp Drive, and a lot of other inventions are still waiting to be discovered. 2001 and 2010 have both come and gone. However, in other ways, such as computers, we have access to devices that were never dreamed of by the early writers. Not one early science fiction writer predicted the rise of the personal computer. I am not talking about 60s and 70s TV series like Star Trek. You can always read computers into Star Trek, but the "computer" was the whole Enterprise and the com units or communicators were merely dumb cell phones with no memory. The closest the writers came to computers was imagining extraterrestrially made devices that were "wonderfully compact calculation machines." See Norton, Andre. 1954. Space pioneers; stories. Cleveland: World Pub. Co., Gallun, Raymond Z., "Trail Blazer," p. 92. The essence of the impact of computers is our ability to almost instantly talk to anyone anywhere on the face of the earth (within a few very practical limitations). In addition, the computer power sitting on my desktop right now is so far above what could have been imagined just a few years ago, that we can hardly begin to speculate how technology already in the pipeline to be sold will continue to affect our lives. One brief example: the iMac Pro: the new iMac scheduled for shipment by the end of this year will have a 27-inch Retina 5K display, up to 42MB cache, up to 4TB SSD, up to 18-core Xeon processors and up to 22 Teraflops of graphics computation. No one could imagine that you would be able to buy that much computer power for a home use. From our near-sighted and parochial genealogical viewpoint, we are still living in the 19th Century. I still talk to people who profess an interest in genealogy that eschew the use of cell phones and have no usable computer skills. We have major genealogical companies that resist using optical character recognition or crowdsourcing indexing. Granted the changes in technology have come faster than can comfortably be assimilated, but what if the world had changed as much as the science fiction writers had predicted? I was caught up in a group discussion recently about fraud. Many of the participants expressed concern and admitted they had been defrauded by such mundane issues as robocalls and other telephone solicitations. As a culture, we are so naive that we cannot even defend ourselves against the dangers inherent in worldwide communication, much less take advantage of the opportunities it affords us. For example, I just received a solicitation to "present" at a major genealogy conference. Hmm. If I did so, I would spend my time, my money and my effort to attend the conference and end up talking to, at most, a few dozen, perhaps a few hundred people. That would be that. I would be one of dozens of other presenters and my presentation would quickly be forgotten. However, let's take a different tack. Suppose I decided to do a webinar for the BYU Family History Library. Preparing that webinar will take me about the same amount of time it would take to prepare a presentation for the major genealogical conference. I would not spend any time at all traveling since I live 10 minutes from the Library. Because of the new technology, I can do my presentation at any time convenient to me with no substantial cost or effort. Once the webinar is recorded, we can upload it to Google YouTube.com on the BYU Family History Library YouTube Channel and I can get hundreds or even thousands of views. What is more, I can do several of these presentations every month not just once a year at the large conference. I can compress a hundred years' worth of conference presentations into a few months of work and anyone, any place in the world (practically speaking) can watch my presentations at a time convenient to them and save the same time and money they would have spent attending a conference. In addition, many other people can take advantage of the same technology. The number of viewers of our combined webinars exceeds any possible projection of the attendance at any possible genealogy conference. Granted, there are other reasons for attending a genealogy conference, but perhaps sitting in a classroom is no longer one of those reasons. By the way, the longstanding genealogy conference in England, "Who Do You Think You Are?" is being discontinued. See "Who Do You Think You Are? Live! Conference to Cease." I happen to see a connection here. Let's look at some other aspects of genealogy that will change due to technology. I regularly go to the BYU Family History Library to help patrons. Most of the time, the patrons have a specific genealogical question they would like me to answer. Let's suppose that they sent their questions to me electronically. 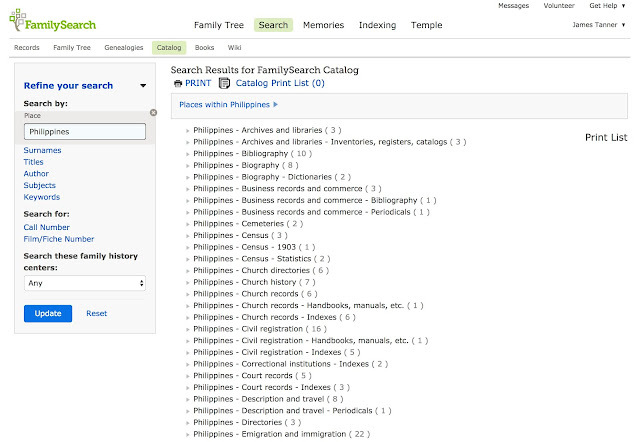 I can now look at their portion of the FamilySearch.org Family Tree and see the problem and see if there is a solution. Let's further suppose that I have a solution. I could simply get together with the person online and through video conferencing techniques "talk" to them while they were working on their home computer and "solve" the problem. Maybe, they would like to meet in person. I could still have looked at their problem before meeting and we could expedite the solution and spend some additional time in training and networking. 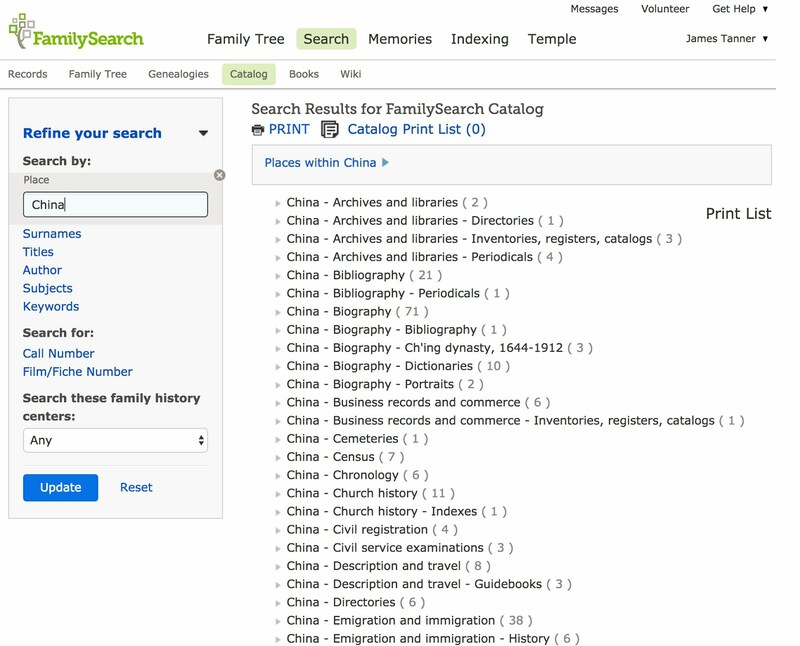 This week, FamilySearch.org and other such websites, have added millions of newly digitized records to their online collections. Most genealogists are oblivious to these newly added records. From my experience, few genealogists even know that the online collections exist. 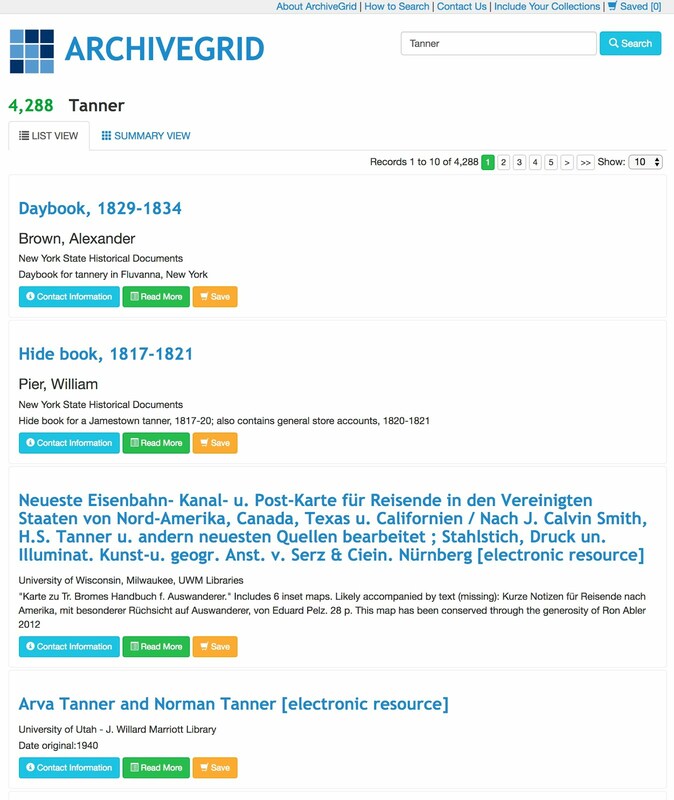 I am consistently making researchers aware of digital collections that they have never heard of. In fact, I am continually learning about new additions to online websites myself and yet there are some genealogists who are more concerned with formalities than substance. They are still worried more about how to present their "findings" than how to use all of the technological changes that are happening all around them. As I expressed in a recent post, my genealogical efforts have taken on the nature of a conversation with the world. Perhaps you would like to join in the conversation? What else is happening? If I will be using Google Fibre with an iMac Pro, I can't even begin to guess what I can do. I am now living far advanced of what I used to read as science fiction. 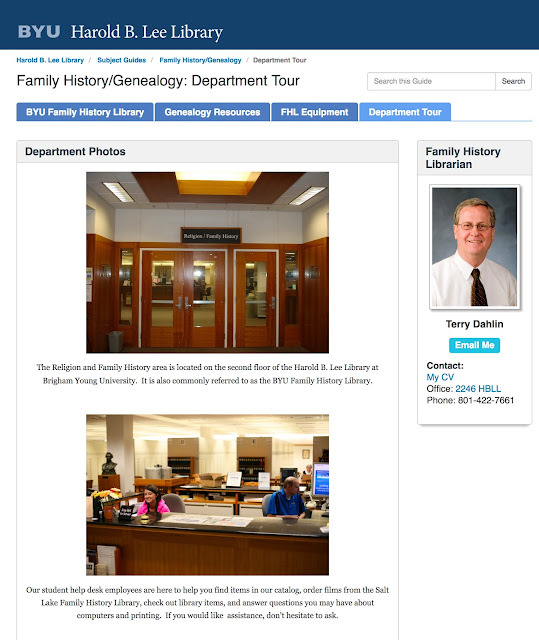 You can access a virtual tour of the Brigham Young University Family History/Genealogy Department online. In addition, the Library provides public access to a broad spectrum of very sophisticated electronic equipment. 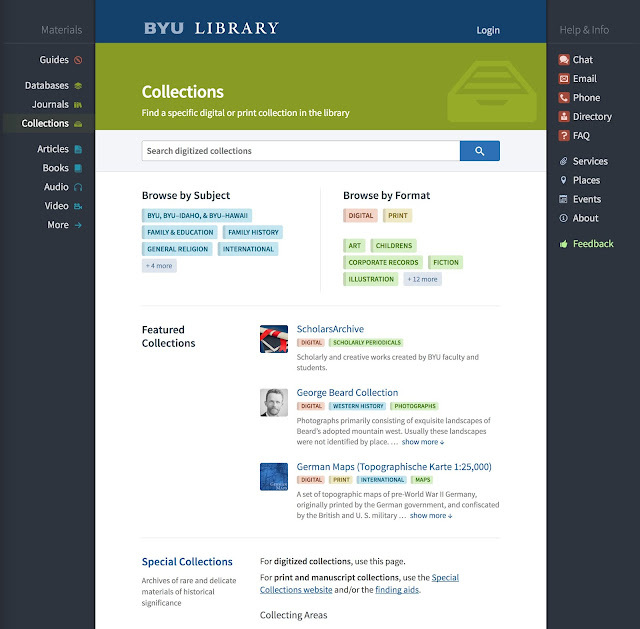 Although I have been focusing on the BYU Family History Library and genealogy, the larger Harold B. Lee Library has a huge online presence. Here are a few more examples of the broad range of online offerings from the Library. 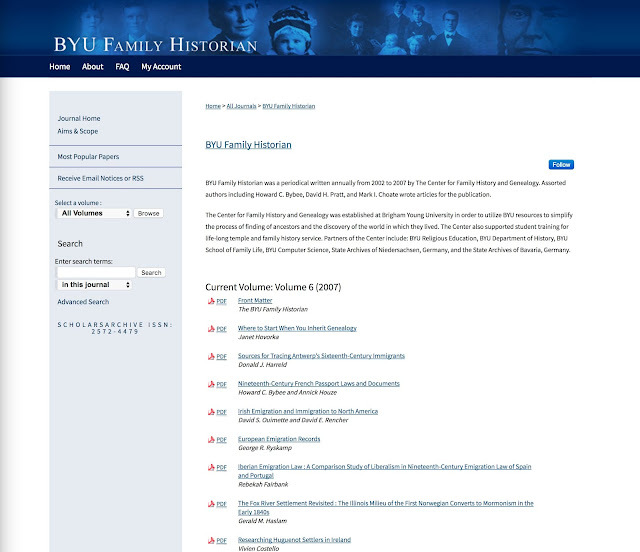 BYU Family Historian was a periodical written annually from 2002 to 2007 by The Center for Family History and Genealogy. Assorted authors including Howard C. Bybee, David H. Pratt, and Mark I. Choate wrote articles for the publication. The Center for Family History and Genealogy was established at Brigham Young University in order to utilize BYU resources to simplify the process of finding of ancestors and the discovery of the world in which they lived. The Center also supported student training for life-long temple and family history service. Partners of the Center include: BYU Religious Education, BYU Department of History, BYU School of Family Life, BYU Computer Science, State Archives of Niedersachsen, Germany, and the State Archives of Bavaria, Germany. 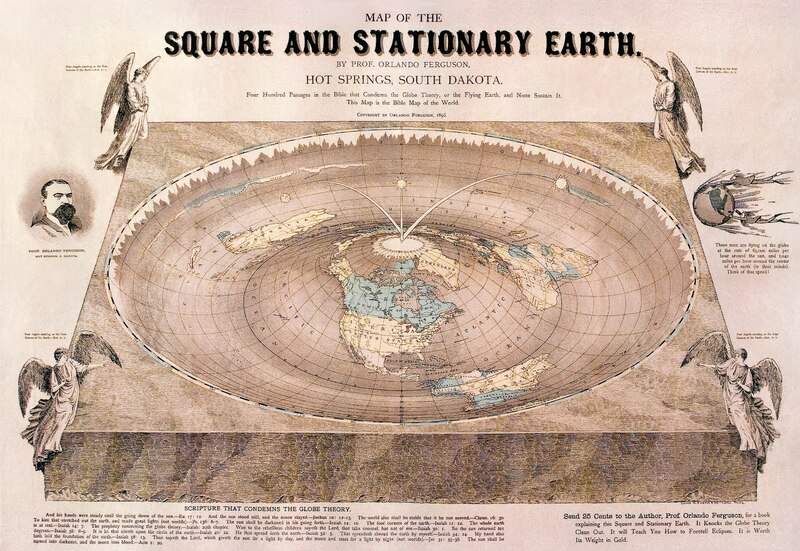 There are over 3,500 maps just in this one collection. 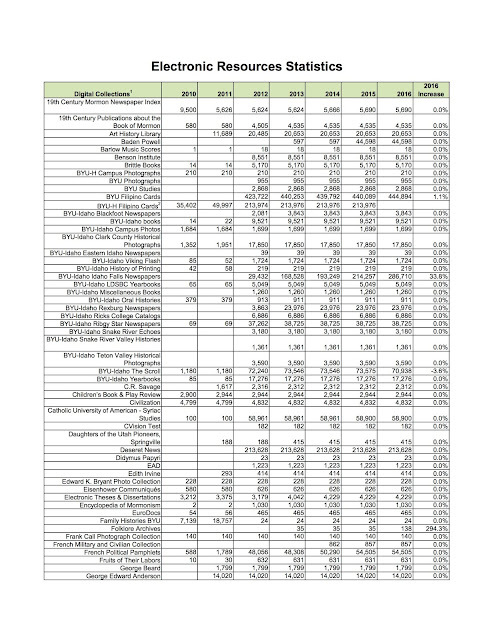 This list includes references to over 2.8 million digital resources. I could continue highlighting collections and resources almost indefinitely and never cover them all. 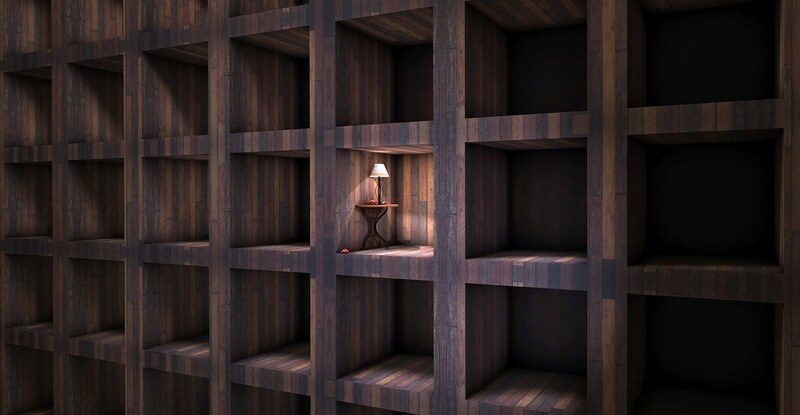 As genealogists, we need to become more collectively aware of the fact that genealogy is history and that the label "genealogy" does not have to appear in a library catalog for the information to be useful for our research. 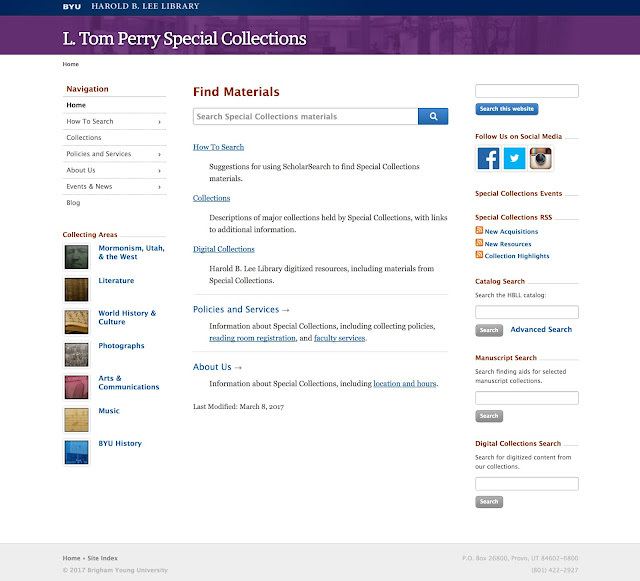 Every major library has a special collections section or department. The Harold B. Lee Library at Brigham Young University has an extensive archive with a huge underground preservation vault. 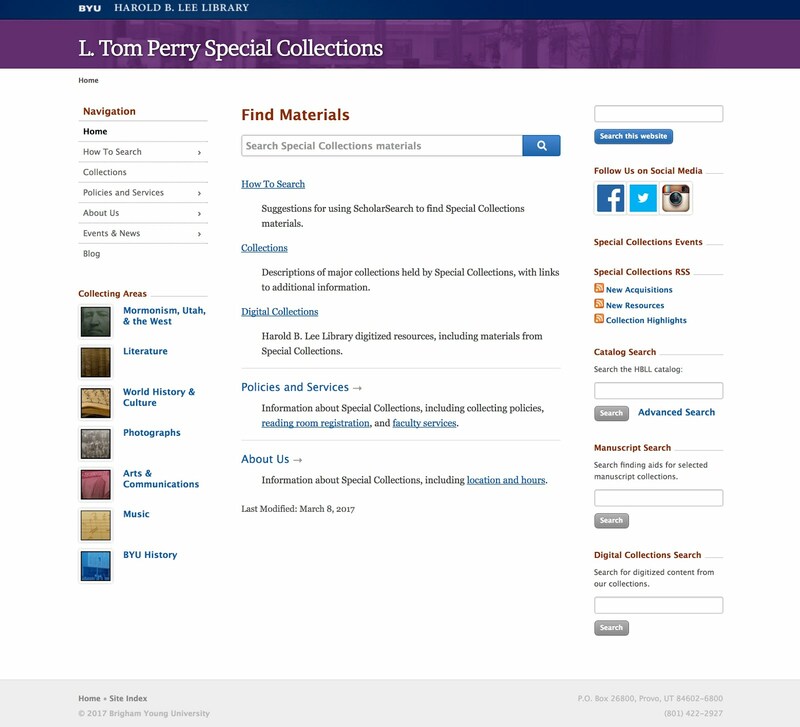 The L. Tom Perry Special Collections Library has some surprising collections. Special collections libraries often collect the "papers" of historically important or interesting people. Usually, in a university or college library, the decisions to add documents to the library's collections is made by the curators, usually professors, at the school. 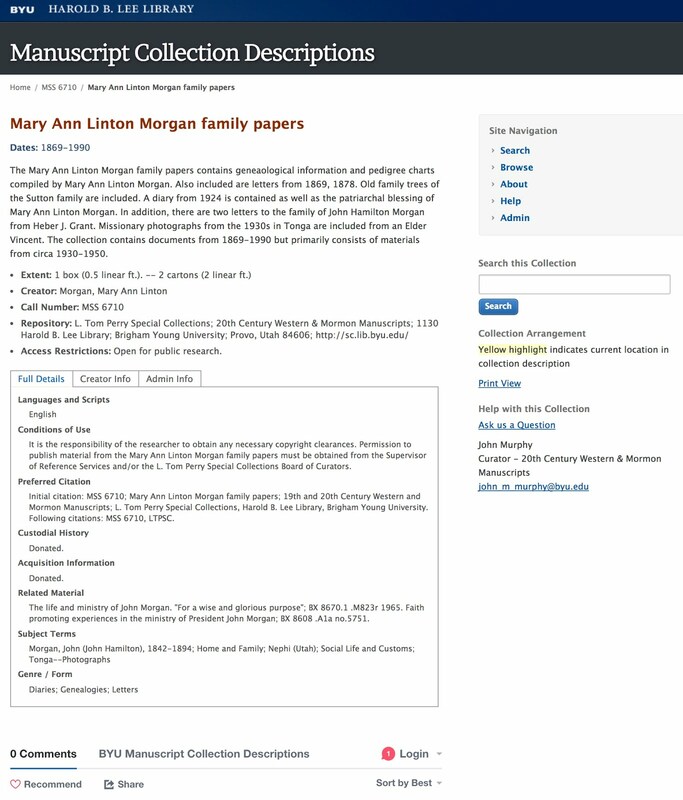 You cannot assume that your family was "too poor" or "too obscure" to have important genealogical documents preserved in a university special collections library. For example, my Great-grandmother accumulated a huge collection of genealogically important documents during her lifetime. Normally, those documents would have been lost to her posterity. But, I made the effort to convince the BYU Special Collections Library to take all the documents. There are over 16,000 names of people she collected in those documents. Here is the catalog entry for the Mary Ann Linton Morgan Papers. These "papers" are genealogically and historically valuable. 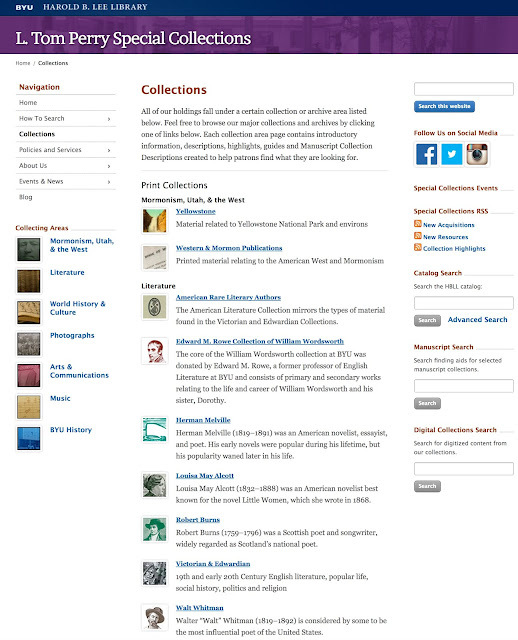 A more complete description of the papers is contained in the Manuscript Collection Descriptions. The idea here is simple. 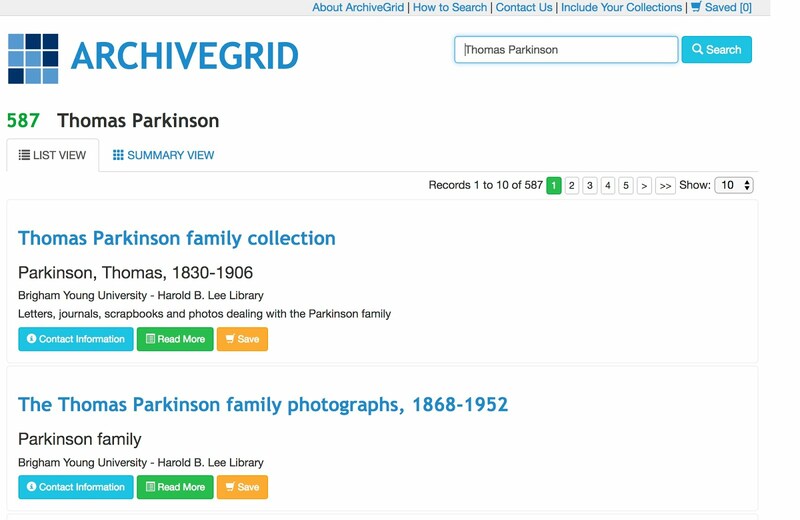 Special collections libraries might have some valuable documents relating to your family history that are "mixed in" with a collection from someone who lived at the same time and in the same place as your family members. You will never know what is there unless you look. 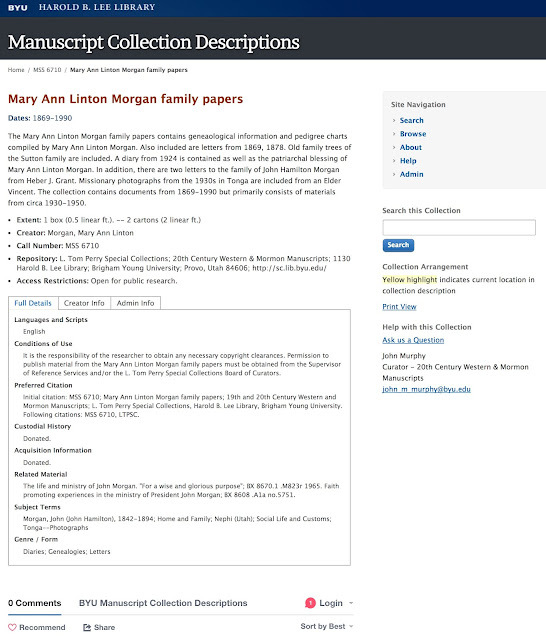 Here is the entry for the Mary Ann Linton Morgan family papers from ArchiveGrid.org. Here is another entry for another of my ancestors. Of course, I am using my own ancestors who lived in the Utah/Arizona area. But there are special collections libraries in every part of the United States and many foreign countries. 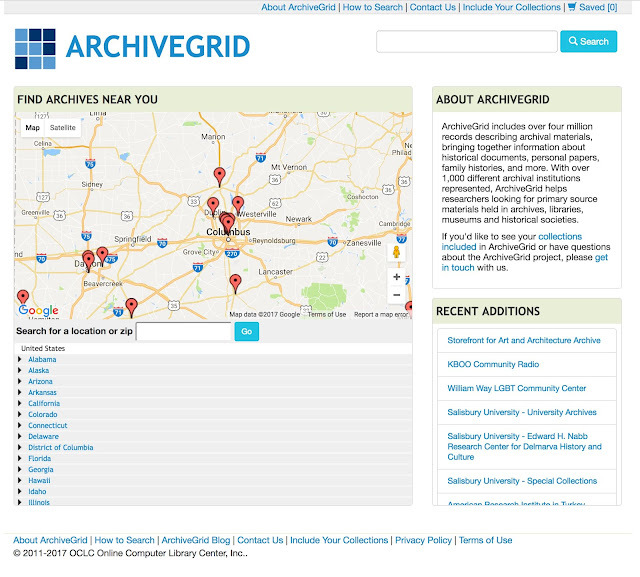 These libraries have collections of documents that may include many of your ancestors. I could keep going with examples of people with huge collections. But here is one more example using my surname and searching in ArchiveGrid.org. There are 4,288 collections of documents. How many of these pertain to my family? That is a question that can only be answered by searching through the catalog entries and looking for the neighbors, friends, and associates of my ancestors. For an illustration, let me use an ancestor who lived in another area of the country. Simply because I happen to know a lot about my family, I can recognize that some of these papers might have information about my own family. Dustydocs is a 'web-linking site' of English Baptisms, Marriages and Burials records for the years 1538 to 1900. Our information is sourced from freely available church BMB records and validated user contributions. Searches can be conducted using family names and/or locations. Dustydocs categorises England into counties and towns to facilitate searches within specific locations. We encourage you to contribute to our growing source of information by adding a certificate, correcting existing dates, or adding new links. New countries will be added to Dustydocs as our database expands. You may find that this website opens up new possibilities for your British research. The Digital Public Library of America (dp.la) has increased its free online collections to 16,520,747 items. The most recent acquisition is a connection to Digital Maryland. Every time one of these huge collections are added to the Digital Public Library of America, genealogists benefit from the included genealogical and historical data made available from this one location. Here is a quote from the DPLA Blog about the new addition. Our collections and our partner network are growing! The collections of our newest hub, Digital Maryland, are now searchable in the Digital Public Library of America (DPLA) alongside millions of resources from partners across the country. 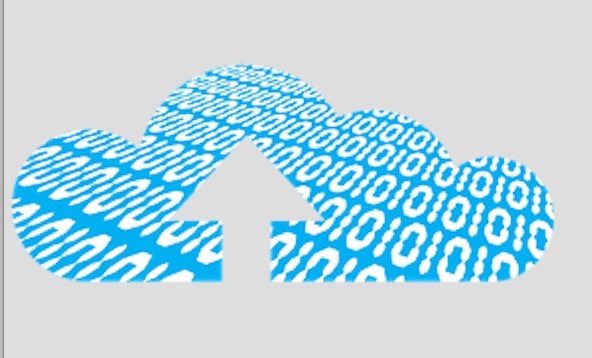 The new Maryland Service Hub represents a collaborative effort between Digital Maryland, a statewide digitization program, and University System of Maryland & Affiliated Institutions (USMAI), a consortium of seventeen public colleges and universities across the state. 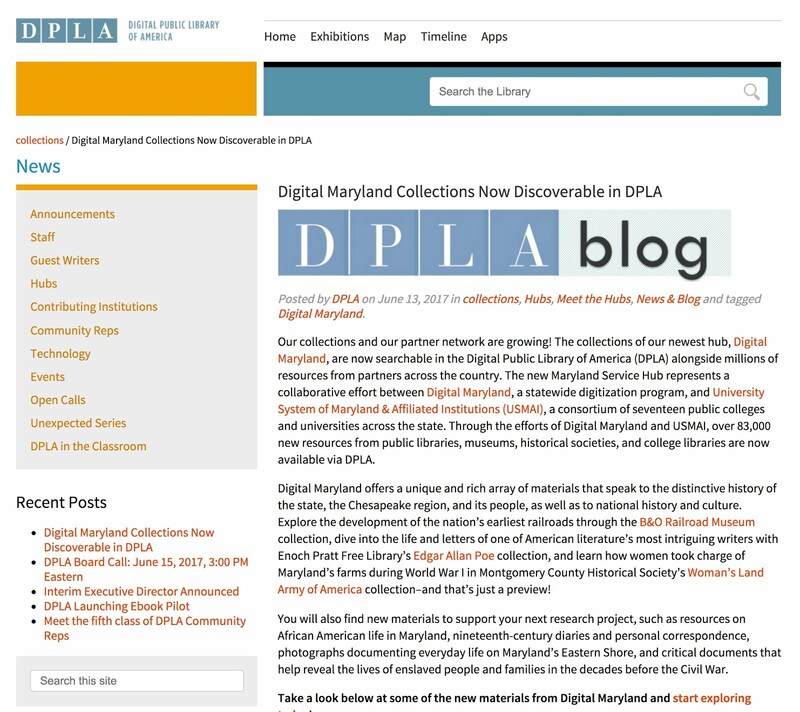 Through the efforts of Digital Maryland and USMAI, over 83,000 new resources from public libraries, museums, historical societies, and college libraries are now available via DPLA. Digital Maryland offers a unique and rich array of materials that speak to the distinctive history of the state, the Chesapeake region, and its people, as well as to national history and culture. Explore the development of the nation’s earliest railroads through the B&O Railroad Museum collection, dive into the life and letters of one of American literature’s most intriguing writers with Enoch Pratt Free Library’s Edgar Allan Poe collection, and learn how women took charge of Maryland’s farms during World War I in Montgomery County Historical Society’s Woman’s Land Army of America collection–and that’s just a preview! 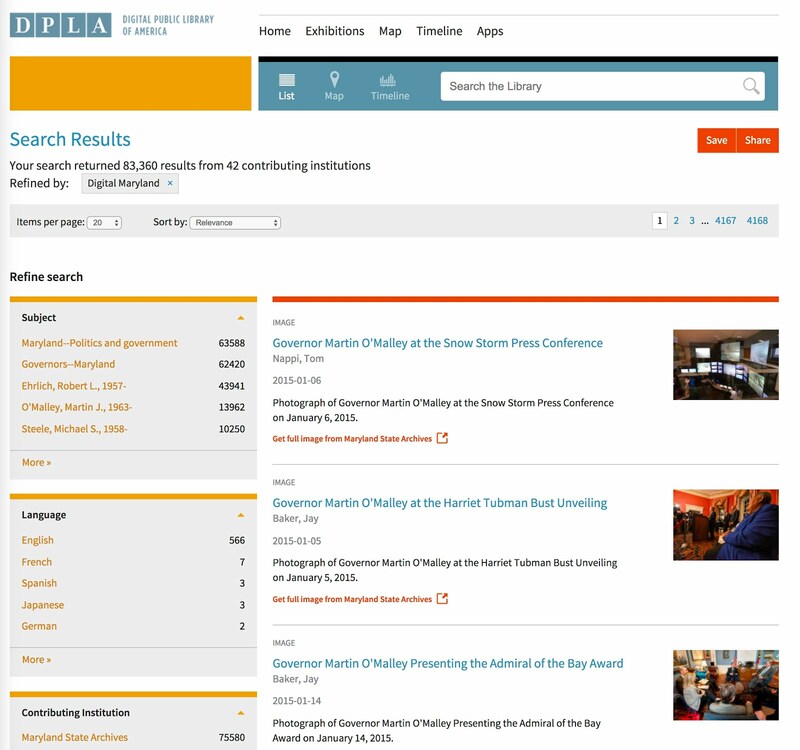 I have been following the development of the DPLA website since its inception and as the website grows, it is fulfilling its original goal of becoming a go-to portal for online historical and genealogical research. Why was this important? As I have written many times, identifying the place where an event occurred is the key to finding records about the individual and the family. I began with a two prong approach; deciphering the handwriting and trying to locate the places mentioned on maps and in gazetteers. The place as it was recorded in the Family Tree, did not seem to exist. The real problem was that the place named on the military record did not seem to be the same as the place recorded on the Family Tree. They both referred to a place in "Bayern" or Bavaria, but nothing else seemed to match. The development of alias surnames was often tied to agriculture. When a man moved to a new farm, he sometimes changed his name to the name of the farm. Also, when a man married a woman who had inherited a farm, his name may have changed to her family name. In this situation, some of the children born to the couple may have used his surname, while others in the same family used the wife's family name. In this situation, I sought out one of the missionaries serving in the BYU Family History Library for help with place names. He began searching in the Meyers Gazetteer of the German Empire aka Erich Uetrecht. Meyers Orts- und Verkehrs-Lexikon des Deutschen Reichs. 5th Edition. 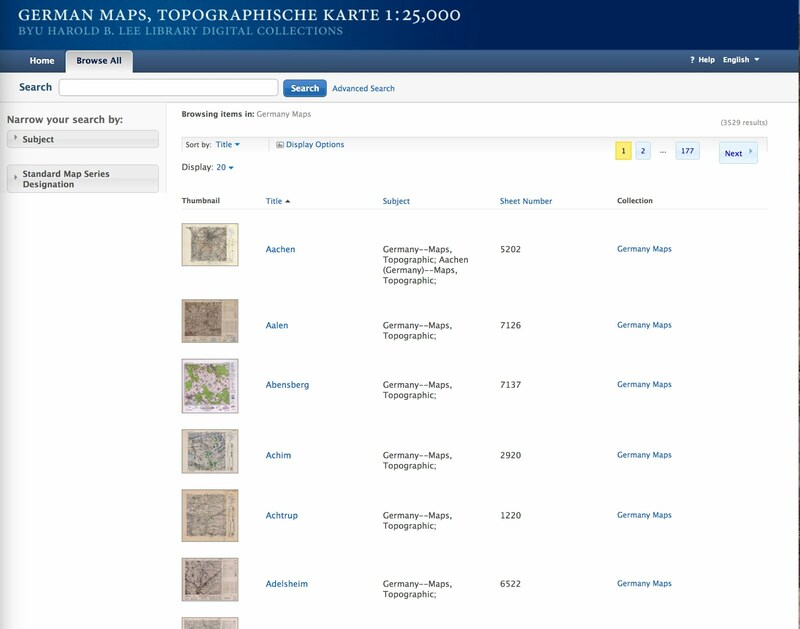 Leipzig, Germany: Bibliographisches Institut, 1912-1913 and very quickly solved the apparent conflict between the place names. 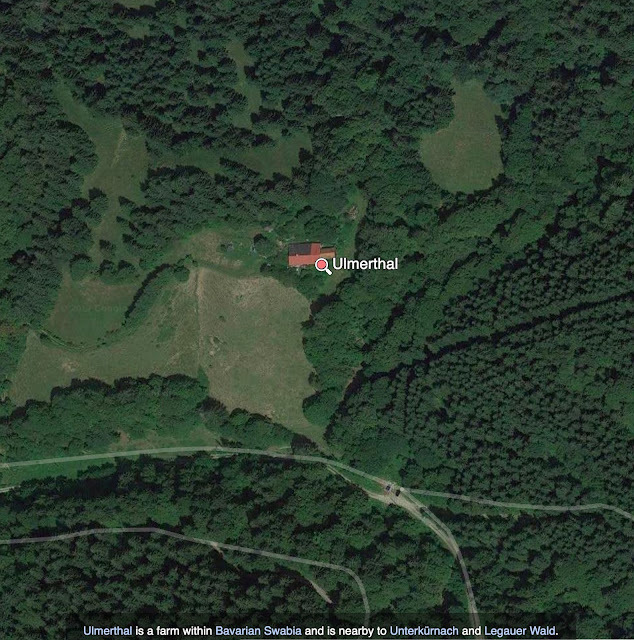 As I suspected, the first place in the Military Record is deciphered as "Ulmerthal" a farm name, and that agrees with the name of the place as it is recorded in the Family Tree. Ulmerthal is near Kempton, which is the place recorded in the Military record. Kempton is also in Swabia, Bavaria. So, some of the places between the two different entries were in agreement. But the key here is that the entry in the Family Tree did not mention Kempton or Kreuzthal. After some more digging, the name of the place was sorted out. The key here is that according to the Meyers Orts all of the records for this area would be found in Kempton. Now we get to another problem. 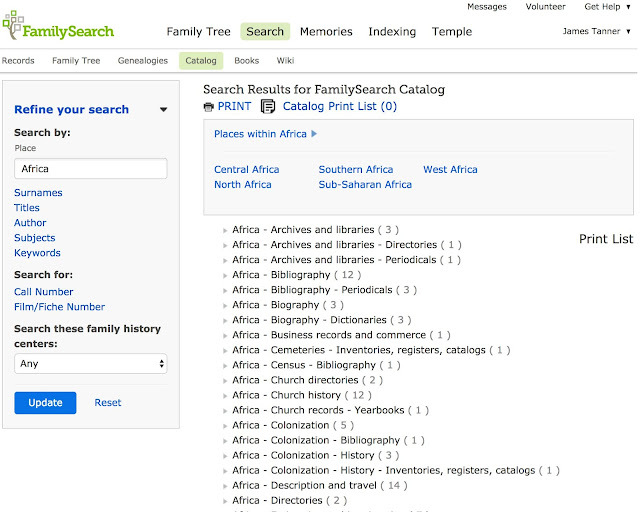 FamilySearch.org and the other online document database programs do not have this as a place. Here is a satellite view of the farm. But the key still remains that the records are in Kempton which was not mentioned as the place was previously recorded in the Family Tree. Because of the size and complexity of the Brigham Young University (BYU) and its long-term interest and commitment to genealogy, there are many online resources maintained by different departments. Of course, the most prominent is the BYU Family History Library, the recently implemented BYU Family History Portal leads to most of the other resources. 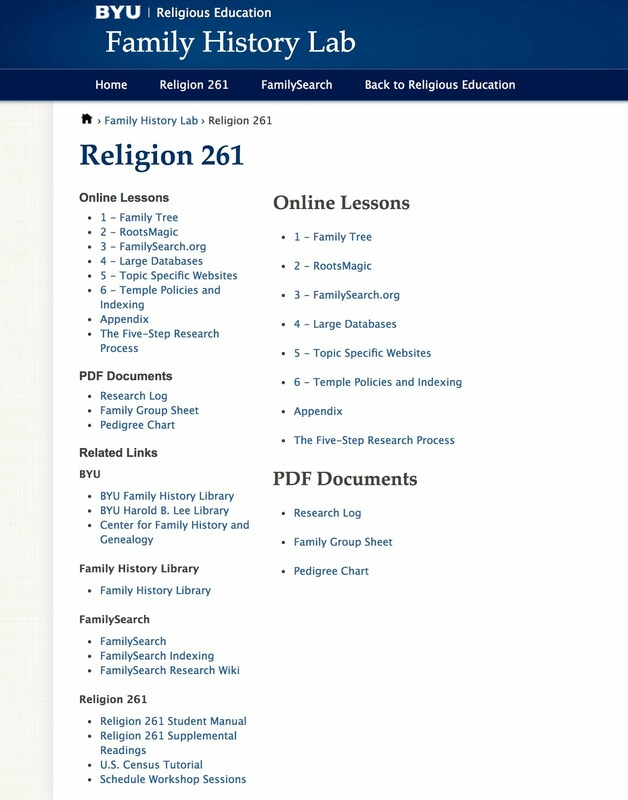 The Portal has a link to Religion 261, a college level course introducing family history. Although the course is aimed at students, the materials and lessons are freely available online for anyone to use. However, since the materials contained in the course are directed at the students attending BYU, some of the information contained in the outlined classes includes religiously related instruction concerning the doctrine of The Church of Jesus Christ of Latter-day Saints (LDS). 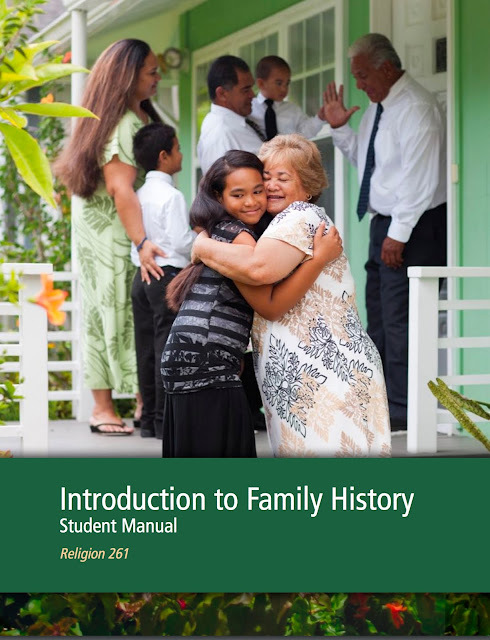 Here is a screenshot of the Introduction to Family History, Student Manual. If you have ever wondered why members of the LDS Church or Mormons are interested in family history, this is a good introduction. One of the most innovative and advanced areas of family history technological investigation is being conducted by the BYU Family History Technology Lab. Of course, there is a link to the Lab from the BYU Family History Portal. 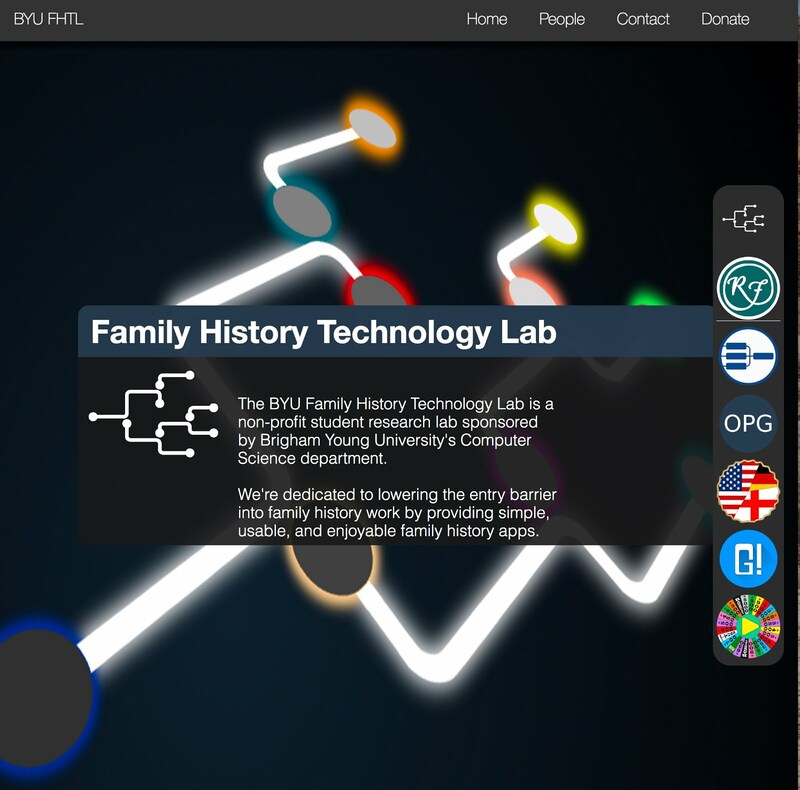 The BYU Family History Technology Lab is a non-profit student research lab sponsored by the University's world famous Computer Science Department. During the past few years, the BYU Family History Technology Lab has developed a number of family history related programs. Icon links to the programs are on the right side of the screenshot. 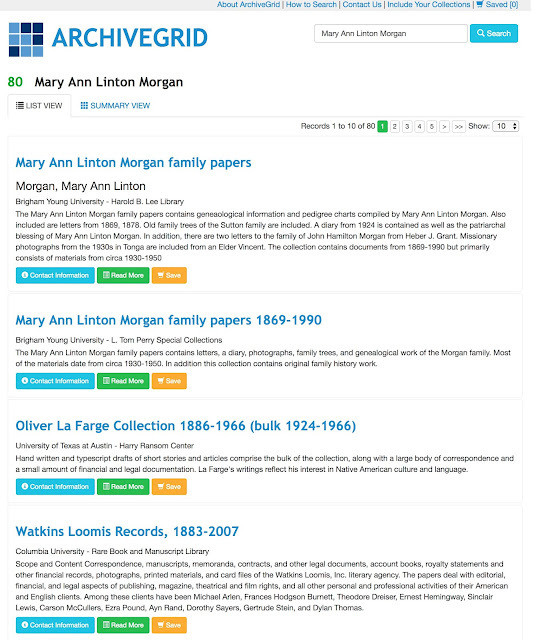 All of these programs are related to the FamilySearch.org Family Tree and require the user to be a registered user of the Family Tree as well as to have information in the Family Tree. Some of the programs are fun family history games. Sitting in the quiet of the morning and looking out the window at the wooded hillside, I often wonder about the phenomenon of writing on a computer and sending what I write out to the world. Genealogy is such a personal pursuit and for years what I thought and what I wrote was also very private. No one besides my immediate family, consisting of my wife and children, had any idea that I was involved in so much research and writing. Then one day, the internet came along and I start posting short bits of ideas online. After fussing around with a few other blog ideas, I started Genealogy's Star on November 21, 2008. Now almost 5000 blog posts later, I am still writing. There have been some dramatic changes in the genealogical community in those years. We spent almost three hours yesterday listening to Ron Tanner of FamilySearch talk about the future of the FamilySearch.org Family Tree. Almost all the ideas he talked about were only vague ideas just eight or nine years ago and now most of them are well developed or will be shortly. We are sometimes so completely involved in what is going on right now, we cannot see how rapidly the world of genealogy (and the rest of the world for that matter) is changing. One of the major benefits of being online with the blogs and all of the YouTube videos on the BYU Family History Library YouTube Channel is that I can immediately identify with and talk to people all over the world. Granted, the genealogical community is very small compared to other interests, but because it is small, I can feel like I am part of a real community and not just one of the minions in a nameless and faceless mob. What is really going on in genealogy is part of what is going on around the world with technological changes that allow us to actually carry on conversations with the world whether we like the idea or not. Genealogy has become a very public topic and issue. Those who choose to ignore its public nature are very likely simply repeating what has already been done and because of the geometric progression in the number of our ancestors, the further back we do our research, the more likely it becomes that our efforts are being duplicated by someone else. Genealogists who ignore this reality are deluding themselves into believing that what they are doing is somehow unique. I was recently helping a friend with his research. He is an immigrant who came to America as a child from Europe. In the course of helping him discover his ancestry, I began searching for records in the Ancestry.com website. I immediately had record hints (green shaky leaves) for others who share his ancestral heritage. I am certain that he is entirely unaware of his relatives that are doing research about the same people he is interested in finding. Our lack of knowledge about those who are doing concurrent research into our common ancestors and relatives does not mean they do not exist. Just as I can sometimes believe that no one out there reads this stuff, people with less contact to the internet than I have can firmly believe that they are the only ones "working" on a given ancestral line. In imagining this, they are denying the very nature of the world as it exists today. What is even more isolationist is to believe that you are the only one doing any "real" research and that the rest of your vast web of relatives are all stupid and don't know what they are doing. 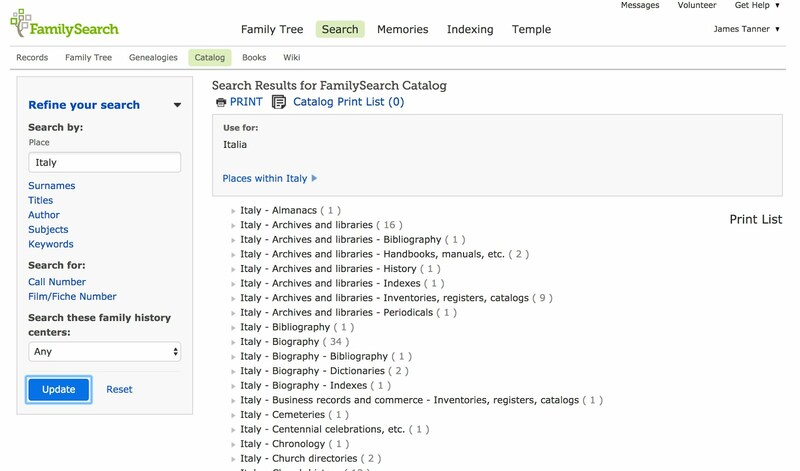 Yesterday, my daughter was showing me an exchange she was having with a researcher on the FamilySearch.org Family Tree with a relative who was doing some extremely detailed and documented research into one of our family lines and correcting the misinformation online. We may believe that no one else out there knows how to do research or could possibly contribute anything useful, but we would be wrong every time. In essence, we are all talking to the world, but the real question in genealogy is are we listening to the responses?